The power of creativity, urge for revolution, rage about stigma and rights, pride that comes from a different way of knowing, and the joy and relief of sharing a safe space with peers. 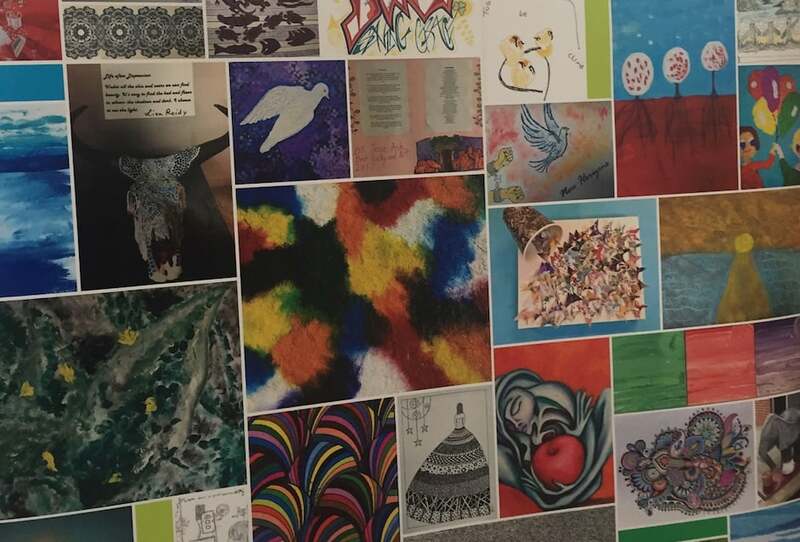 They were among the key themes and feedback to emerge from the recent Victorian Mental Illness Awareness Council (VMIAC) conference in Melbourne. 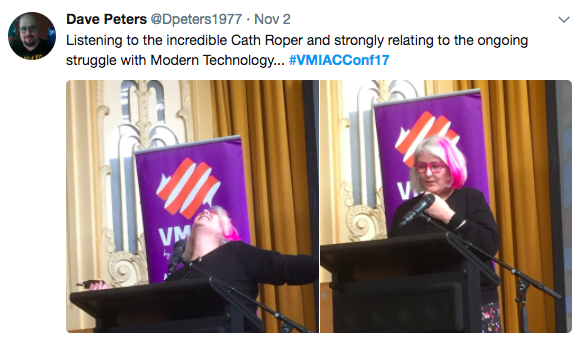 This final wrap article features video interviews, snapshots and clips related to presentations, and powerful takeaway messages from a number of delegates/presenters in a VMIAC Vox Pop below, plus final tweets from the conference. The discussions about freedom, revolution and rights were a standout feature of the conference, Victorian researcher and tertiary educator Cath Roper told Croakey, ahead of hosting a final reflection session. There was also an emerging sense that there are “different (and) … larger ways of being in the world” that are “freeing and energising” and counteract pressures to be “normal” or “recovered”, she said. “I think mad people have a lot to offer in the way we do business in the world, the way we are in the world,” said Roper, who is a consumer academic at the Centre for Psychiatric Nursing at the University of Melbourne. “Some of the monitoring and surveilling and self-surveilling kind of stuff we do in other areas of our lives, I think there’s too much of that in the world and a lot of people yearn for more freedom, more psychic freedom, more emotional freedom,” she said. Roper said she was also inspired at the conference by a crest of new people, including peer worker presenter Hamilton Kennedy, who talk about purposefully using their experiences, in ways that are both truthful and courageous – “using hurts and strengths”. On workforce issues, she told delegates she was struck by discussions about the need for “equity not equality” and to be recognised and paid for “expertise not representation”, and for greater strength of numbers. Watch this interview with Cath Roper below, where she talks about the conference and her latest research into consumer perspectives. Croakey readers may also like to listen to this recent RN Life Matters program on involuntary committals, featuring Roper and Bernadette McSherry, law professor and director of the Melbourne Social Equity Institute at the University of Melbourne. Q: What message did you most want to get across in your presentation/s? My message from the conference would be that consumers of mental health services are a community with unique perspectives and understandings of our experiences. We have a significant expertise to offer the sector and, if this expertise was taken up by the sector, we would have such a culture shift that our experiences of service use would be very different than what they are today. There are parts of the human experience that are crucial resources for insight into human suffering, and the human condition, but that we currently tend to shut down or even pathologise – feeling suicidal, self-harm, shame, dissociation, sensitivity and inner voices that we might not be habitually tuned into. I’ve been learning to listen to these parts of myself and have found intense learning, joy, growth, insight and wisdom from this deep listening. And we also need collective listening – those of us who are “canaries in the mine” have much wisdom to share with our communities, but all-too-often, we are shamed and punished and people try to stop our behaviours. We need to listen, and then listen some more! My message in my presentation is to find and honour the unique and diverse authentic voice in each of us. We are all bonded by the abhorrent public psychiatric service, but our paths that led us there are from very different landscapes. We’re all mostly survivors of developmental-age trauma, not mentally ill people/people with mental illness. Let’s call it for what it is. Let’s demand attention for our strong and proud culture of survivorhood. We need to feel empowered to think about and reveal our stories. We must expect our stories to be listened to and honoured. We deserve our stories to change things for others. My message is also one of creative joy. The genuine creative spirit yearns for place to emerge and evolve. If we deny that spark in us, it will find ways to speak up through the miracle of mental illness. I wanted to present Deadly Thinking so that everyone was aware of the program and what it is about and how it can help everyone with their social and emotional well being. (see snapshot of the program for Aboriginal and Torres Strait Islander people below). Q: What was your main ‘takeaway’ message from the whole conference? My personal takeaway message is that there is still harm being done to us even when we are on the ‘other side’ of the fence; however, I personally struggle with this. The message is not one of needing ‘protection’ but as needing to be included more in decisions and having more leadership opportunities. For instance, there are a number of senior positions in Victoria that have previously had consumers in them and they are now held by clinicians, some saying that they have lived experience even though they have never worked from that perspective, and others that openly say that they have no lived experience. This goes to a deep issue of culture of mental health sector and the credence given consumers and consumer workers. My main ‘takeaway’ message from the whole conference was that we are an incredibly diverse community, and that diversity can be enriching, if we honour and make space for complexity. In particular, it was beautiful to witness the honoring of elders and major thinkers in our movement, as well as the emerging voices, those working inside the system and those creating vibrant spaces outside the (damaged and damaging) system, those who can stand on stage shaking and vulnerable, and those who think to offer keynote speakers water, a warm shoulder and presence. My takeaway message from the afternoon I was there (including Cath Roper’s final address) was one of re-couragement. The year saps advocates’ spirit and courage. I think we all felt a burst of love, and a regeneration of energy to keep going, keep chipping away at the systemic malpractice. Hope for redress, yet work for address. I would expect that the voice of people with lived experience will have greater power in policy around our public psychiatric wards. We’re currently looking at a roll in of pseudo prisons based on the real fear of violence perpetrated by violent minority who are actually better placed in prisons. People with lived experience of trauma have to live in psych wards with these few people who take a big slice of the $40 million. What about $40 million towards healing centres for non-violent patients? The takeaway message for me was that not enough people know and understand the huge impact not addressing your mental health can do and how it affects everyone. Q: What was the standout presentation/s for you? The standout presentation for me was Fay Jackson’s keynote – she spoke from a place of deep pain and strength and wisdom, having just come from the funeral of one of the leaders in our movement (Ed: read this earlier tribute at Croakey to Jackie Crowe). It was one of the most human, and humane presentations I’ve ever seen, coming not from any ego or power or defensiveness, but grounded in raw human passion and self-reflection and connection. The presentation from Keir Saltmarsh (see below) at the beginning on the second day. Q: Where would you most like consumers’ voices to have an impact over the next year or so? How long is a piece of string??? There is so much work to do, we need more support for consumers to work in academia and research, more consumers working in government, more consumers in leadership roles. But the priority for me is for more understanding of the impact of compulsory treatments on consumers, their lives and health. I would like the public to be more aware of the difference in life expectancy that is associated with mental health ‘treatments’, for the public to be aware of the impact of trauma, for the public to understand that as a person diagnosed with a mental illness, I am much more likely to be the victim of violence than the perpetrator. I would most like consumer voices to be involved in laying the foundations for a Truth and Reconciliation process in psychiatry, as advocated by UK Professor Mike Slade in his book ‘Personal Recovery and Mental Illness’. So many talks at the conference spoke about the terrible harms people have suffered and continue to suffer in the name of psychiatric “help”. For me, that has predominantly been being shunned, pathologised and rejected when I am struggling with suicidality – the very system that is meant to be there to support healing has inflicted incredible harms on so many of us. Consumer voices (and bodies and inner voices!) are needed to create the kind of spaces that would lay robust foundation for healing for trauma survivors, communal support and respect for spiritual emergence, a society that honors and respects diverse ways of being, redress for systemic oppression, and all the other things we are grappling with. Having more opportunities for people to share their experiences and personal stories. Not too many musicals feature terms like ‘psychosocial care’, ‘reasonable and permanent supports’ and ‘permanent and/or significant disability’. 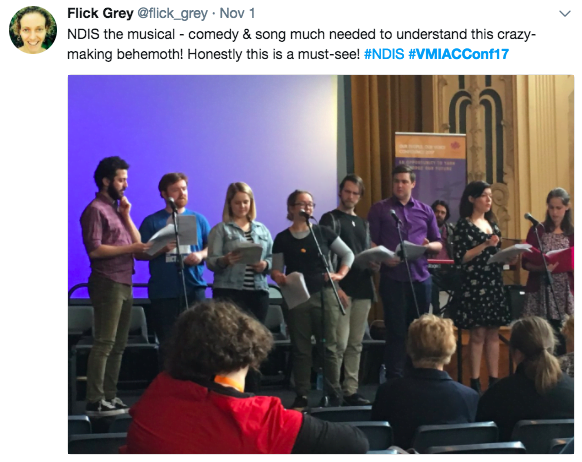 But NDIS The Musical: The Elephant in the Room is, unsurprisingly, not your ordinary musical, but should be must-watch entertainment for politicians and policy makers. All the progress that has been made in the mental health world is to do with the recovery model and things being based on strengths and hopes and the idea that (mental ill health) is not permanent. Have a quick peek below at the opening song, performed at the VMIAC conference in Melbourne. Watch this interview with Dave Barclay and fellow performer Kayla Hamil. To book a performance, contact VMIAC. Wiradjuri woman Margaret Saunders presented to the conference about Deadly Thinking: a social, emotional well-being and suicide prevention program specifically designed for Indigenous communities, confronting core social and mental well-being issues in a culturally appropriate, accessible and compelling way. A video blast from the past from Keir Saltmarsh, one of the keynote speakers and Senior Education and Engagement Officer at Victoria’s Mental Health Complaints Commission. Read other stories from the conference here. … all who tweeted and shared the news from the conference. The Twitter transcript can be read here, and the analytics below show there were more than six million Twitter impressions, with 225 participants using the hashtag. 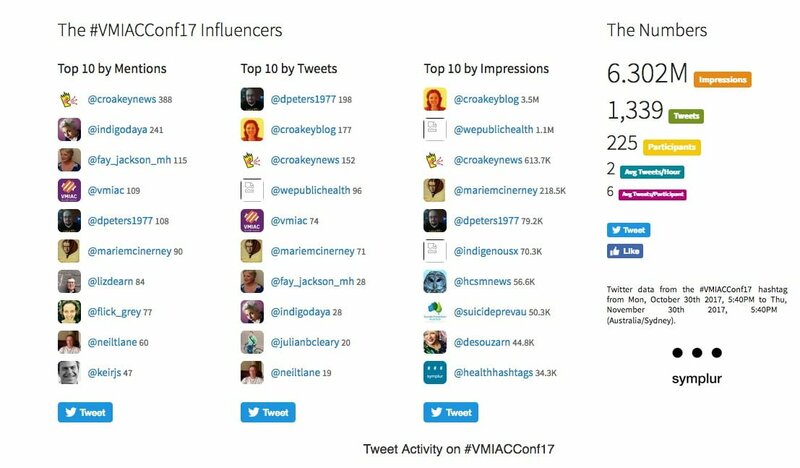 Journalist Marie McInerney covered #VMIACConf17 for the Croakey Conference News Service. Bookmark this link to follow her stories from the conference.